This side dish is a very special one. It has a unique, exquisite taste, that makes it the perfect companion for holiday or Valentine's dinners: Fennel scented, delicious mashed carrots! 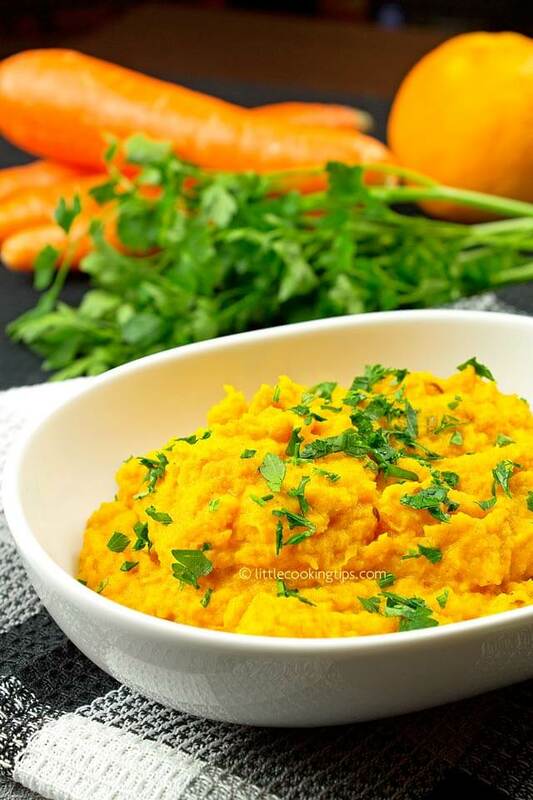 This mashed carrots recipe, is fantastic for accompanying roasted turkey/chicken, rotisserie chicken, roasted pork, and fish steaks or fillets. Of all the previously mentioned combinations, our favorite one is the one with the fish. We often grill a simple cod fillet, sprinkled with salt, lemon and olive oil and accompany it with this amazing carrots puree. Of course it's also great with a salmon steak. Since the Christmas season is almost here, we think you 'll find dozens of uses for this recipe! It's really worth trying, and the best part is, it's really easy to make. You simple simmer the carrots with the ingredients mentioned and mash them with a bit of butter. As simple as that! Of course this also a healthy side dish, full of antioxidants, and suitable for vegetarians. It's so much better for you to use this puree instead of the classic mashed potatoes side. Besides, this is also so versatile! So let's see how to make this delicious side! Pour in the stock (pic.3), the orange juice (poic.4) and stir. Once it starts simmering, reduce the heat to medium-low and cook until almost all of the liquid has evaporated, about 30-35 minutes (pic.5). Stir every few minutes. Add the rest of the butter (pic.6) and using a hand blender, mash and stir until you get a smooth result (pic.7). You can also use a food processor to achieve the same. Sprinkle with finely chopped parsley and serve! 1. If the water has evaporated before the 30 minutes, and the carrots are still not soft enough, then add 1 cup of warm water and continue cooking until it evaporates. 2. You can also add 2-3 tablespoons of heavy cream when you mash the carrots with the hand blender for a richer result. Alternatively you can also add 1 tablespoon of crème fraîche or Greek yogurt as well.